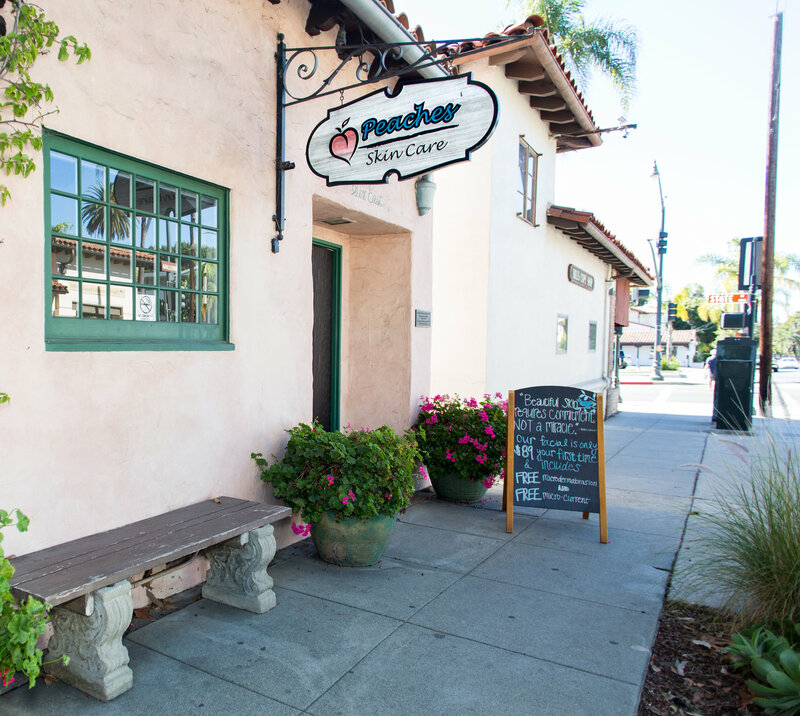 Peaches Santa Barbara is the premier natural skin care salon in Santa Barbara, CA. Our philosophy is simple, yet effective. We don't advocate for any invasive procedures, injections, chemical peels, or harmful methods of any kind. Our master estheticians have worked diligently for years on thousands of clients perfecting the single facial we offer, the Signature Peaches Facial. That's right, we offer one facial for all skin types. Our intensely developed facial works on skin types and conditions of all kinds. From those seeking a facial for anti-aging purposes to those suffering from light to severe acne, we can help you achieve your goal of perfect skin. Come experience truly effective skin care. We perform one facial here at Peaches Skin Care. Most clients come into Peaches believing they have oily, dry, sensitive, or acne prone skin. While these are real side-effects/conditions, they are not natural conditions; your skin reacts in a way that forces it to appear oily, dry, or sensitive as a result of something in your routine that your skin doesn’t like. Your skin is the largest organ in your body and has effective defense mechanisms. The skin will thicken itself, causing a calloused top layer to form whenever you use harsh products or procedures on it. This thick layer of skin causes deep lines, clogged pores, acne, and dark spots. A proper skin routine and a regular Peaches Signature Facial will bring up beautiful, healthy skin while removing old and damaged skin. Our methods have helped thousands of clients over the past 30 years maintain their skin at home with our results driven routine. Acne, dark spots, and wrinkles cannot be washed or masked away, therefore, we use professional microdermabrasion, thorough extractions, high-grade oxygen, and micro-current muscle work in our facials to achieve fantastic results. For acne to truly disappear, it needs to be cleaned and extracted properly. We use our micro-current muscle work as a natural, longer lasting facelift; gone are the days of deep lines and wrinkles! All our services combined achieve the results of new and healthy skin free of any blemishes. No matter the skin issue you are experiencing, we can repair it. We will give you perfect skin naturally. Peaches will show you how to care for your skin and teach it to heal, breathe, and renew! Before booking your first facial, please know that it is a process to heal and transform the skin. While you will see incredible results after the first facial, we are not a “one and done” type of salon. Compare it to working out at the gym, you need to put in dedication and time to achieve the results you are looking for. It also takes dedication and time to bring up new, healthy, unblemished tissue and firm the face muscles. Consistency and regularity are key in achieving truly amazing results. We are not a “fluff” facial, spa facial, or “girl’s day out” relaxation facial (although we give some awesome massage during the service). We are here to transform your skin, and we assure you that we will give you the best facial you have ever had! Michelle has had a first hand experience of the benefits of proper skin treatment and derma-brasion. She has a passion for achieving skin-perfection in all her clients. She loves to help people in need of care, because after overcoming her past skin problems, she knows that with her all-natural and non-invasive treatments, any complexion can be healthy and clear. Michelle has lived in Santa Barbara her whole life, and knows how to make skin flourish in this unique environment. Fluent in Spanish and English, Nicole enjoys all aspects of the beauty industry including being immersed in an environment that embraces creativity. She has a deep understanding that client care is a primary contributing factor to a successful business and aims daily to exceed each client’s expectations. Whether it be offering a drink, a special greeting, or a warm smile; she always strives to create a lasting impression. Like most women, she has faced her own skin challenges which made her interested in skin care products and services. Casey was born and raised in the Pacific Northwest and graduated from the Euro Institute of Skin Care. She relocated to California to be closer to family and feels blessed to have discovered beautiful Santa Barbara and a career opportunity at Peaches that supports her own beliefs about health and skin care. Her long personal struggle with her own skin led her to pursue a career as an esthetician. Born and raised in Ventura, CA, Sophie is an outgoing, loving, and caring person who loves the beach, dogs, and has a dedication for helping people. Her skin care journey started very young as she has always had a passion for everything beauty, make-up, and skin care related, but it really shifted to mainly skin care during a break out with cystic acne. After trying nearly everything, her skin only started to get better after routinely getting facials and it really cleared after going to school to become an esthetician and learning the proper way to take care of her skin. Now Sophie just want to spread that knowledge and help others feel comfortable and confident in their skin! Allison is a Santa Barbara native who has always had a special interest in skin care and natural beauty. Having been in the service industry for many years, she finally decided to pursue a different career where she could truly change the lives of others. Her goal with every client is to help them feel beautiful and confident in their own skin, doing so with genuine care and a completely non-invasive, holistic approach. Melissa is a central coast native, who’s passion for skin care began while working at a medical spa here in Santa Barbara. After witnessing the harmful effects invasive procedures have on the skin first hand, she decided to peruse her own journey to become an all natural esthetician. Over the years Melissa has struggled with acne, and found the Peaches way to be most effective in giving her a healthy, clear complexion! She is honored to be working here at Peaches, to help change people’s lives by achieving their skin care goals!